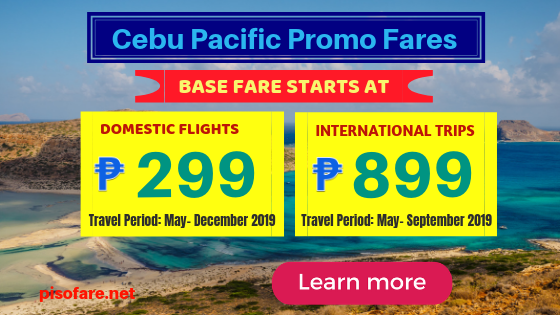 Get ticket for your 2019 trips via Cebu Pacific sale tickets as low as P299 base fare domestic routes! The ongoing seat sale of Cebu Pacific Air offer domestic base fare promos starting at P299 base fare for one-way trips starting May 2019 until December 2019 for flights from the airline hubs in Cebu, Cagayan De Oro or Clark. 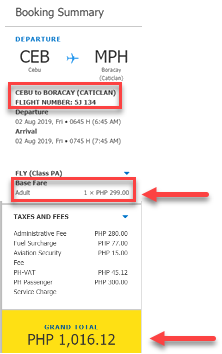 Meanwhile, international sale tickets of Cebu Pacific cost as low as P899 base fare for one-way travel to select foreign routea. 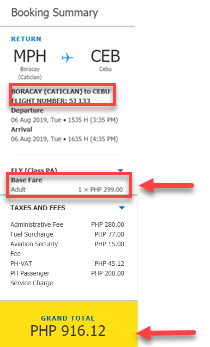 Cebu Pacific international promo fares are valid for flights May to September 2019. Booking for this promo is until April 16, 2019 or until seats on sale are available. Tickets on sale are LIMITED and on First Come, First Serve! Since Cebu Pacific promo tickets are on limited availability, you need to book or buy the low fares as soon as possible. Mentioned ticket rates cover only the base fare and up to 7 kilos hand carry baggage. Web Admin Fee, taxes/ fees, Fuel Surcharge and Terminal Fee are excluded. Book Cebu Pacific low fares by booking online at www.cebupacificair.com where there is no need to input a promo code in booking. Buy tickets at Cebu Pacific sales and ticketing offices, accredited travel agents or booking offices. Contact Cebu Pacific Reservation Hotline Numbers in the Philippine and other countries to reserve ticket. For your convenience in buying the Cebu Pacific tickets, here are Cebu Pacific Ticketing Offices in Metro Manila, Luzon, Visayas, and Mindanao. Check the List of Holidays and Long Weekends of 2019 to aid you in planning your trips. What are you waiting? Book your tickets fast and enjoy your trip! Get updates on Cebu Pacific and other airlines promo fares and seat sale 2019- 2020, PISO FARE promos and travel tips; FOLLOW our Facebook: PISO FARE TICKET!! !